THIS is the Art-Deco designed F Unit nose as found on one of our kits built as an F2 or Phase I F3. It was first seen on the 1939 designed FT diesel and aside from the newer style pilot little has changed from the 1939 original. The small number boards add to the feel of an earlier design. 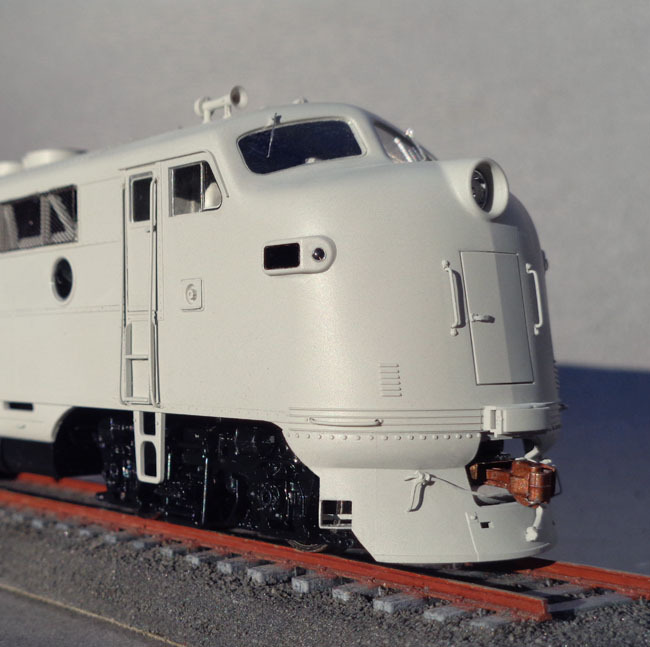 No other HO Scale F Unit's nose (and there have been a great many!) even those directly copied from our own proprietary original effort, comes close to or genuinely captures the nuance and subtle curves found with the prototype. CAD design is quite involved and simplification is the key to the reduction of tooling costs. To be plain, we did not go that route. This loss of accuracy even on direct copies of our shell is especially true regarding the contour blends and the windshield's perimeter shape and method of execution. Those windows being "the eyes to the soul" so to speak. As with those others, fit a three-sided single piece of injection-molded clear polystyrene "window glass" from the inside into an overly-thick walled cab and you have a nice "model (toy?) train" ...but certainly not what you see here. Only the Highliners F Unit has a true to scale, thin-walled cab feature. This thin wall aspect is very visible when the glass is individually and externally fitted as seen here and throughout this website. When carefully photographed even at a reduction of 1:87.1, all of these extremely small miniatures may easily be mistaken for the real and full sized "item"!